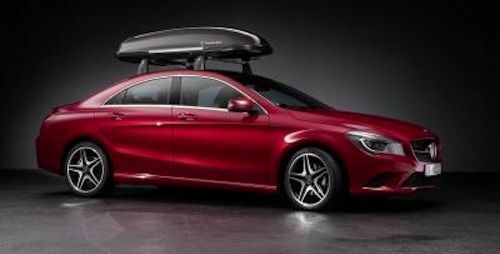 Mercedes-Benz pulls out all the stops with the 2014 CLA by featuring more than 170 new accessories that set the CLA Class far apart from the crowd. With more than 170 new accessories available on the 2014 Mercedes-Benz CLA Class, we would need to spend the next week devoted to listing everything that is available. So we will list the most interesting and what many CLA buyers will be most interested in. And there are some that are way out there that we will have to tell you about. Why would Mercedes-Benz feel the need to offer so many new accessories on the 2014 CLA Class? The all-new CLA Class establishes a new segment for Mercedes and brings styling that features world-leading aerodynamics, and different design packages and equipment lines for personalization. Mercedes is attracting a new generation of buyers who have never purchased the brand before and this generation wants individualization of their new CLA. The new CLA is called the “Style Rebel” and will be the lead model in what the brand looks like and has to offer going into the future. Mercedes will offer advanced multimedia systems, dynamic individualization options from Mercedes-Benz Sport Equipment and practical transport solutions of the Genuine Accessories range on the new CLA. It starts with the Drive Kit Plus for the iPhone, together with the Digital DriveStyle app specially developed by Daimler, makes it possible to seamlessly integrate iPhones 4 and 4S in the CLA. This is smart because the generation that Mercedes looks to attract is highly connected via the iPhone. Highlights include Siri voice control, the advanced navigation solution from Garmin with internet-based real-time traffic information, Google online POI search including Street View and 3D map view as well as the real-time location sharing system Glympse. Additional functions come in the guise of Facebook, Twitter and AUPEO! It also comes with Personal Radio, as well as internet radio for national and international stations. Sports enthusiasts won’t be left out as Mercedes will offer equipment under the Mercedes-Benz Sport Equipment label. A number of elegant yet sporty individualization products will include illuminated stainless steel door sill panels that will feature "Sport" lettering which lights up when getting in and out of the vehicle. Another highlight is the custom-fit rear spoiler which accentuates the spoiler lip on the rear of the four-door Coupe. A high-grade primer enables the spoiler to be finished in a choice of paint colors. The new CLA-Class combines its good looks and adds in never before seen aerodynamic efficiency and is the most aerodynamic series production car in the world. Mercedes will offer add-on roof equipment which has been tested in the wind tunnel. The new generation of buyers will have active lifestyles and the new roof accessories will be ideal for sporting activities. The Alustyle Quickfix basic carrier seen in the image above provides the basis for attaching roof boxes, ski and snowboard racks and bicycle carriers. Mercedes says the quick-grip mounting is “extremely easy to use”, while the lockable plastic caps are an effective theft deterrent and at the same time ensure that the quick-release levers cannot become detached. How is this for individualization? The most notable and extreme new accessory offered will be on the Mercedes-Benz Edition 1 model. A special feature of the interior of these models is the yellow topstitching on the sports seats, dashboard and beltline. To match this, Mercedes-Benz now offers a yellow nail polish in the genuine stitching color of the CLA Edition 1. If that doesn’t give buyers personal individualization, nothing will. The Genuine Accessories for the new 2014 Mercedes-Benz CLA and the new accessories catalogue are available immediately from Mercedes-Benz dealers.